The Commonwealth of Australia consists of six states, New South Wales, Victoria, Queensland, South Australia, Western Australia and Tasmania and two territories – Northern Territory and the Australian Capital Territory (ACT) in which the county’s capital, Canberra, is located. Australia has a democratic federal state system of government headed by a constitutional monarch, Queen Elizabeth II. The monarch is represented by a governor-general who is appointed and holds office for a maximum of five years each term. The country has a bicameral parliament, which consists of a 150-member House of Representatives (lower house), together with the Senate (upper house) and the monarch. The Senate consists of 76 senators (12 from each of the states and two from each of the territories). Senators are elected for six years while MPs have to stand for election every three years. Voting in parliamentary elections is compulsory for all Australians over the age of 18. 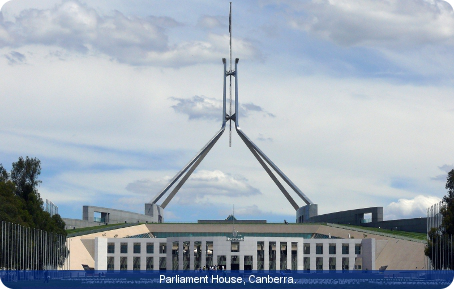 A House of Representatives continues for no longer than three years from the first meeting of the House, but may be dissolved sooner by the governor-general. In practice, however, on winning a majority in the federal House of Representatives, the political party (or coalition of political parties) chooses one of its own, usually the party leader, to become prime minister. The prime minister is head of the executive, allocates ministerial positions, chairs the cabinet, and determines the dates of elections. With a few exceptions, governor-generals have acted strictly in accordance with the advice of their prime minister. There is a strong constitutional delineation of authority between the federal and state governments. The federal government is responsible for taxation, defence, foreign policy, immigration, customs and excise, while the states are responsible for portfolios such as justice, education and health. Each state government has a governor representing the Queen. Five of the states have bicameral legislatures; Queensland’s legislature is unicameral. The constitution states that the judicial power of the Commonwealth is vested in a federal supreme court, known as the High Court of Australia, and in such other federal courts as the parliament creates, and in such other courts as it invests with federal jurisdiction. The Justices of the High Court and of the other courts created by the parliament are appointed by the governor-general in council. The High Court of Australia deals with cases involving international law and domestic constitutional issues, and, at its discretion, with appeals arising from the lower courts, where they are considered to be of sufficient public interest, or where there are differences in the interpretation of the law among the lower courts. It is presided over by a chief justice and six justices. The federal court has 48 judges and the family court 38 (2010). Judges are appointed by the government which does not have the power to dismiss them. The modern Commonwealth of Australia consists of six states: New South Wales, Victoria, Queensland, South Australia, Western Australia and Tasmania and two territories, Northern Territory and the Australian Capital Territory (ACT). The latter has the distinction of containing the country’s capital, Canberra – though the largest Australian city is actually Sydney in New South Wales. The mainland of Australia is the largest island in the world. The term ‘Australia’ is derived from the term Terra Australis, the name given to a southern landmass whose existence geographers deduced before its modern discovery. Although European interaction with the great land mass of Australia only commenced at the turn of the seventeenth century, it is thought that the Aboriginal population has lived in Australia for at least 50,000 years, and perhaps much longer. European (mostly British) colonisation gathered pace in the late eighteenth and nineteenth centuries. The colonies of Australia, all of which had Westminster-style representative institutions by 1890, became one nation on 1 January 1901. It was in 1901 that the Australian National Flag was first unfurled and flown over the Royal Exhibition Building in Melbourne. To this day, the date is still celebrated as ‘Australian National Flag Day’. In 1931, Australia achieved legislative independence from the United Kingdom. Australia’s political system traditionally consisted of the Liberal Party, National Party and Labour Party. The first two of these were frequently in coalition. A new party, the Australian Democrats, was formed in the 1970s. The Liberal-National coalition was in power for much of the period between 1949 and 1983. The Labour party was in power between 1983 and 1996, and was then ousted by the Liberal-National coalition. A referendum was held in 1999 to determine whether Australia should become a republic. Despite evidence from opinion polls that most Australians were in favour of a republic, almost 55 per cent registered a ‘No’ vote. In 2010 Julia Gillard of the Labour Party became the first female prime minister in Australian history.